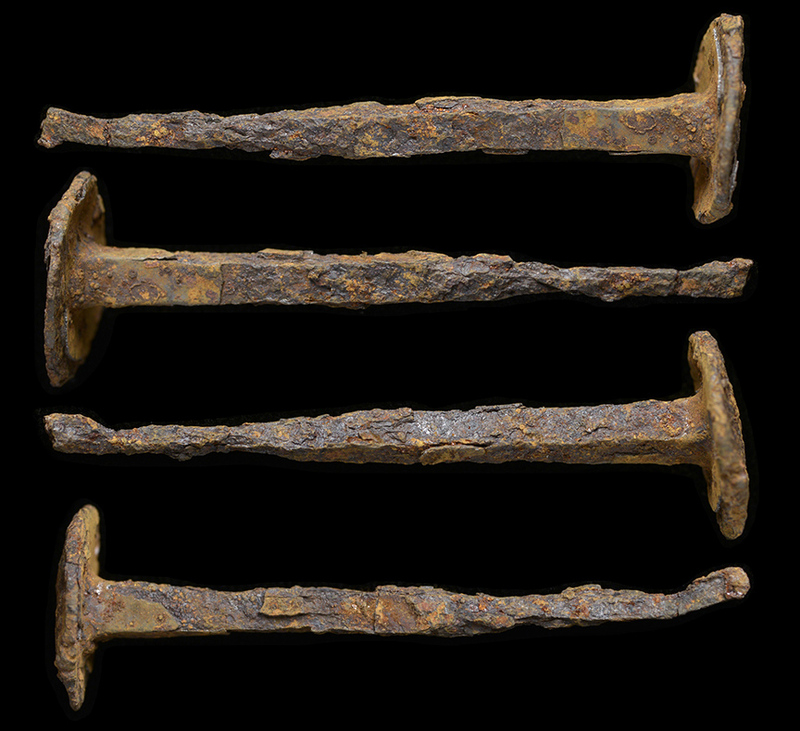 "Crucifixion spikes," Roman nails believed to be the type of device used during the crucifixion of Jesus Christ. 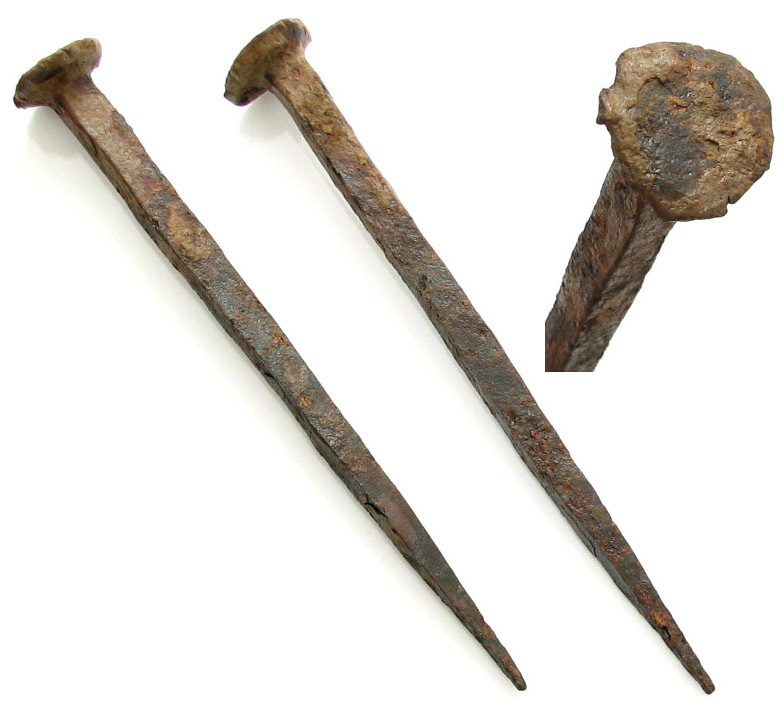 "Crucifixion spikes," believed to be the type of nails used during the crucifixion of Jesus Christ. 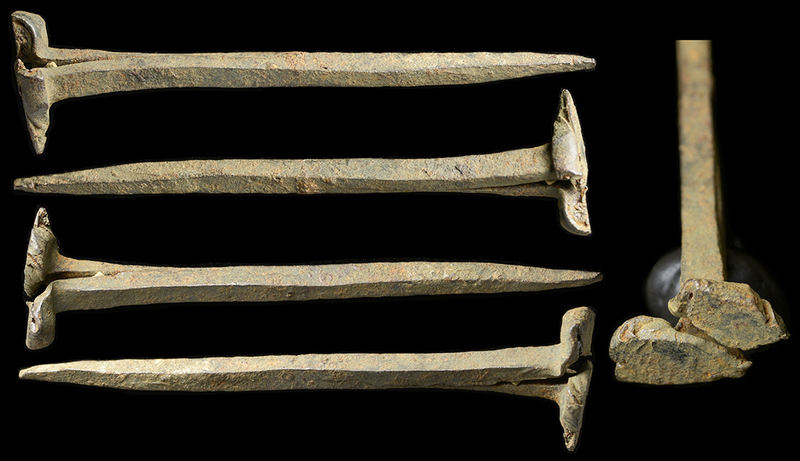 These specific examples were unearthed at excavations of a Roman settlement near Galilee. Ex-Italian collection, acquired in the 1960's. 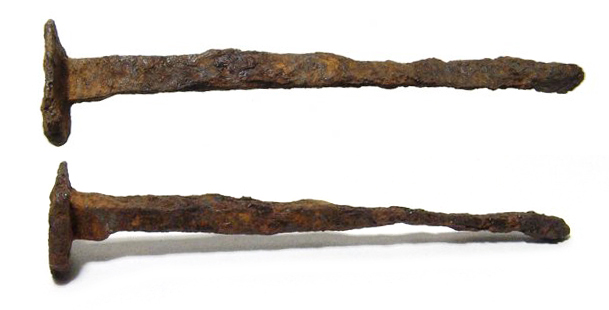 Ancient Roman iron "Crucifixion spike" dating from the 1st-2nd century AD. 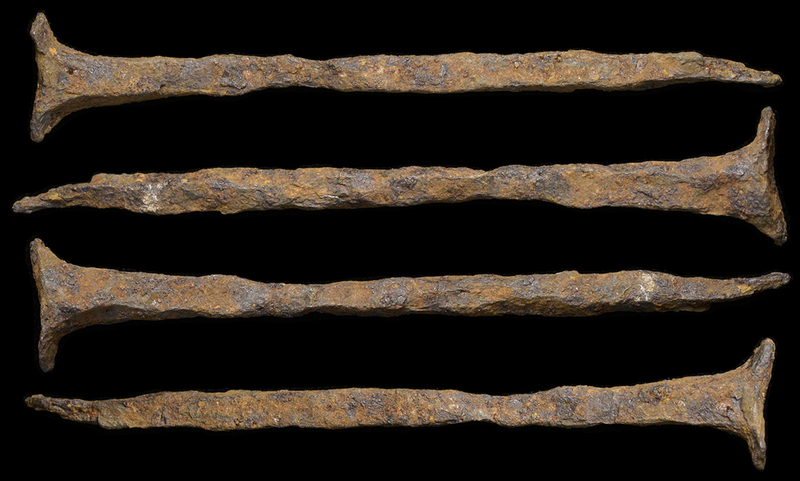 A nice and large piece, well preserved for iron! Squared-off head. 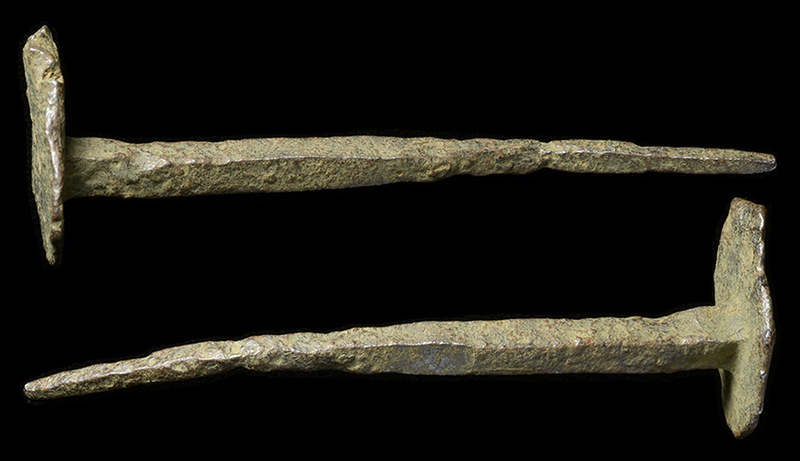 Slight bend in shaft, likely due to use in antiquity. 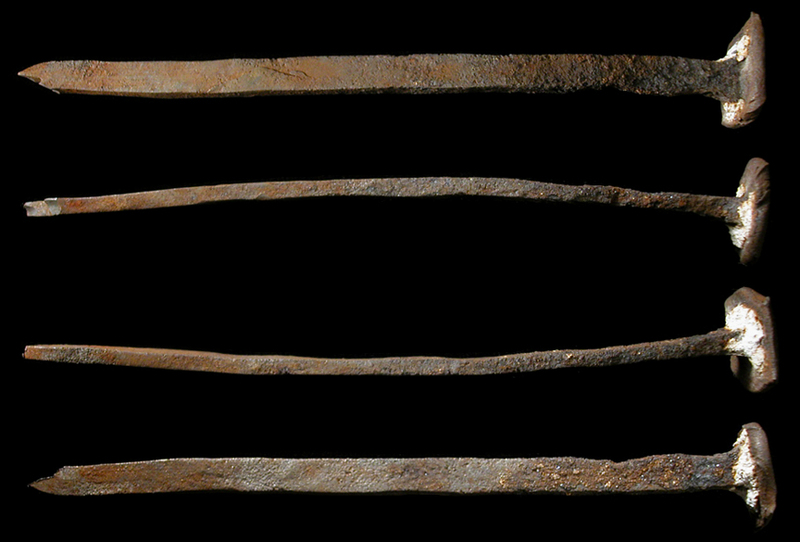 A nice and large piece, well preserved for iron! Squared-off head. 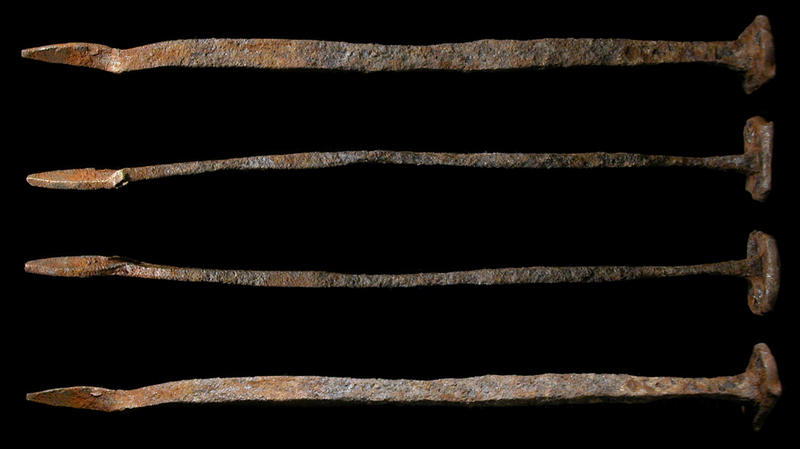 Interesting ripple in shaft, likely due to use in antiquity. 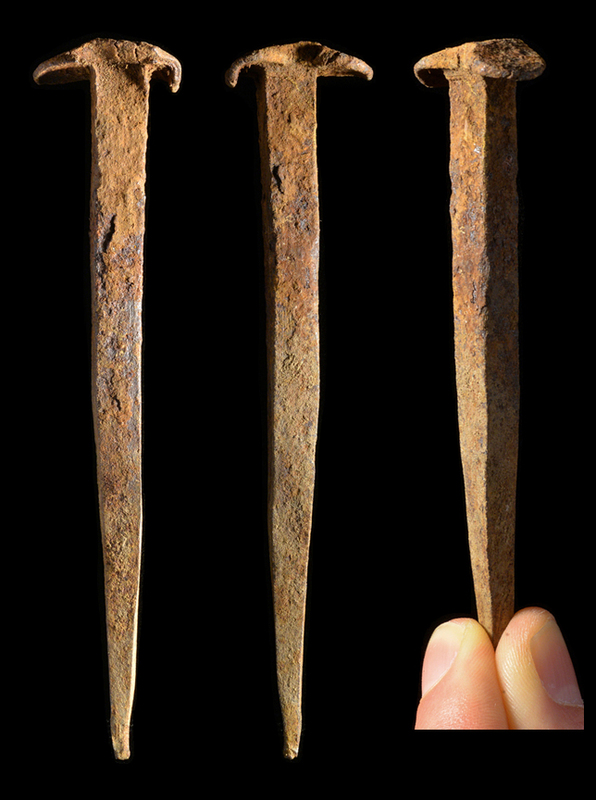 Nice ancient Roman iron "Crucifixion spike" dating from the 1st - 2nd Century AD. Measures 111 mm (4 3/8") long! 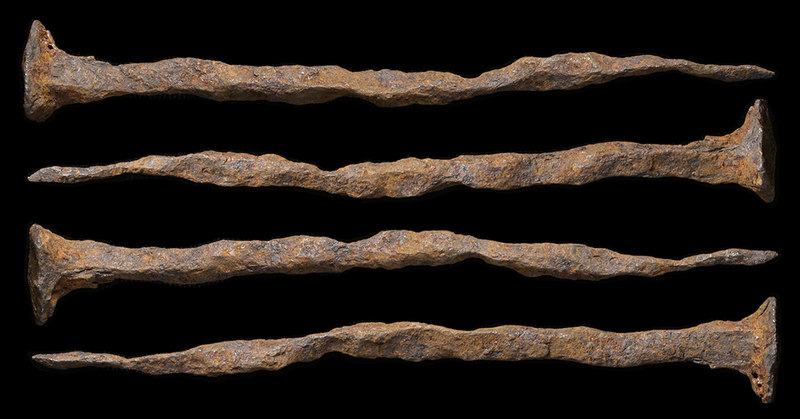 Extremely well preserved for iron. 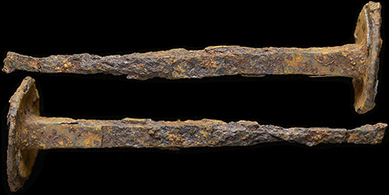 Excellent ancient Roman bronze "Crucifixion spike" dating from the 1st-2nd century AD. A nice example at 108 mm (4 1/2") long. Head pounded round in antiquity, tip still very sharp. Nice bright copper patina. Measures 89 mm (3 1/2") long. 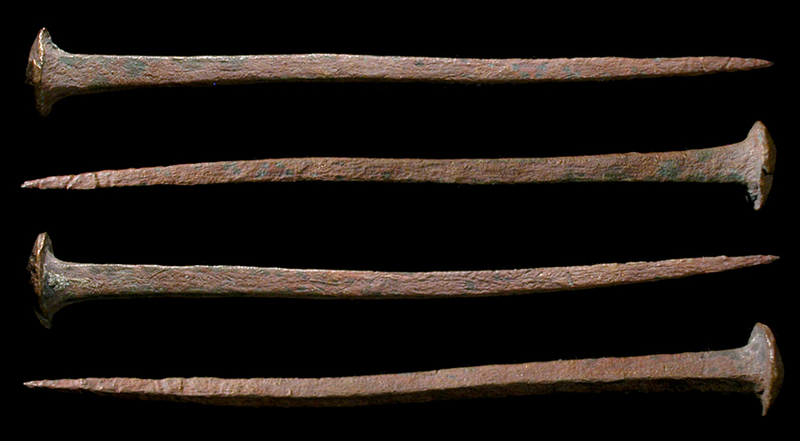 Head pounded round in antiquity, squared shaft, tip still very sharp. 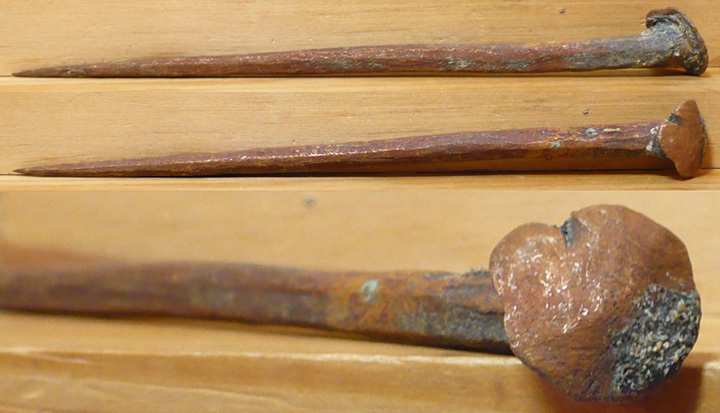 Nice reddish-copper patina. Ancient Israel! 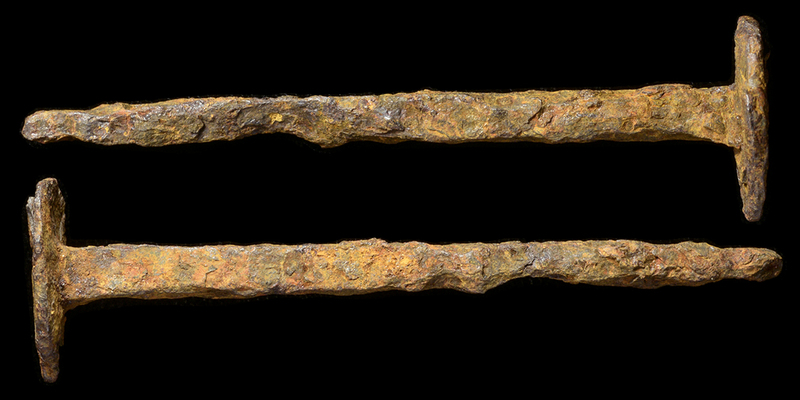 Excellent ancient Roman bronze "Crucifixion spike" dating from the 1st-2nd century AD. 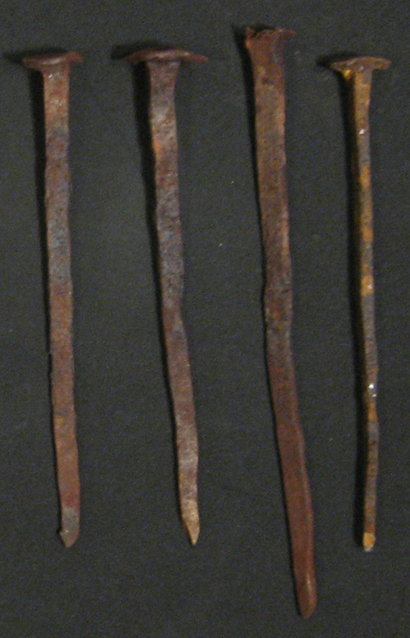 Measures 110 mm (4 3/8") long. Absolutely gorgeous example. Nice maroon to olive-green patina. 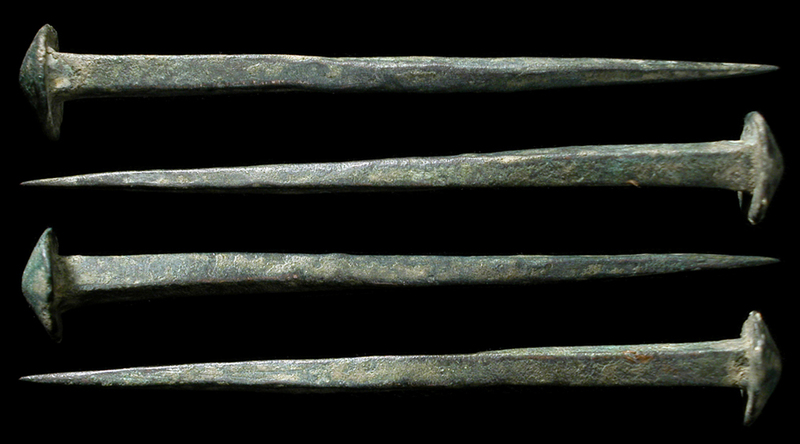 Great ancient Roman bronze "Crucifixion spike" dating from the 1st - 2nd Century AD. Found in Israel! 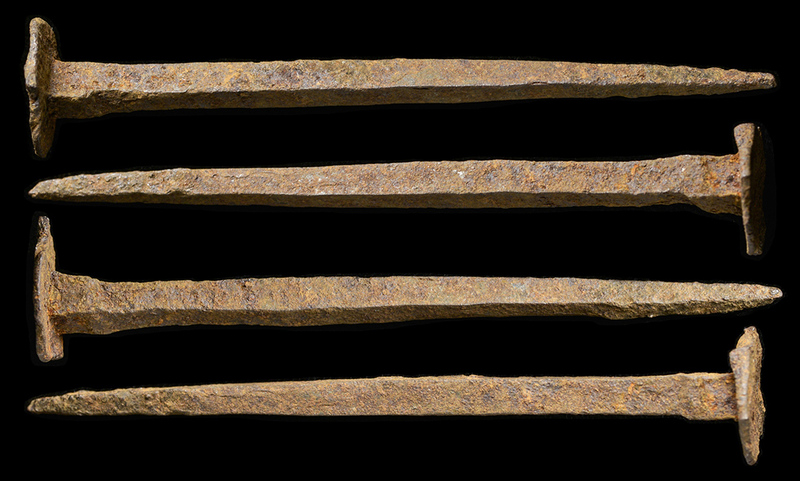 Measures 117 mm (4 5/8"), with nice reddish-green patina and earthen deposits on the surfaces. 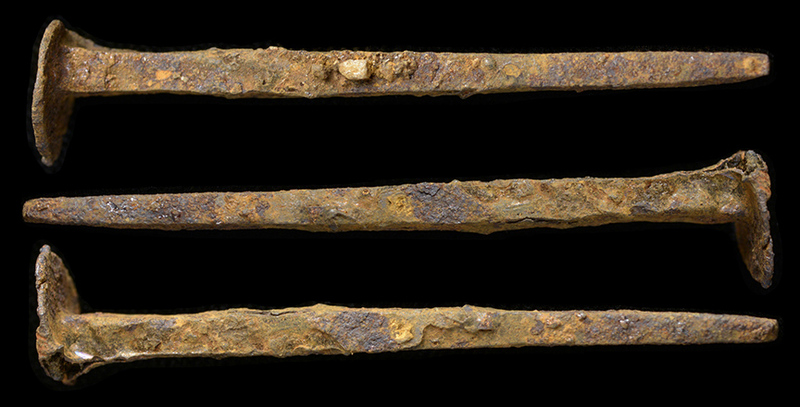 Shaft bent from use in antiquity. A nice example at 120 mm, 17.83 grams. Head pounded round in antiquity, tip still very sharp. 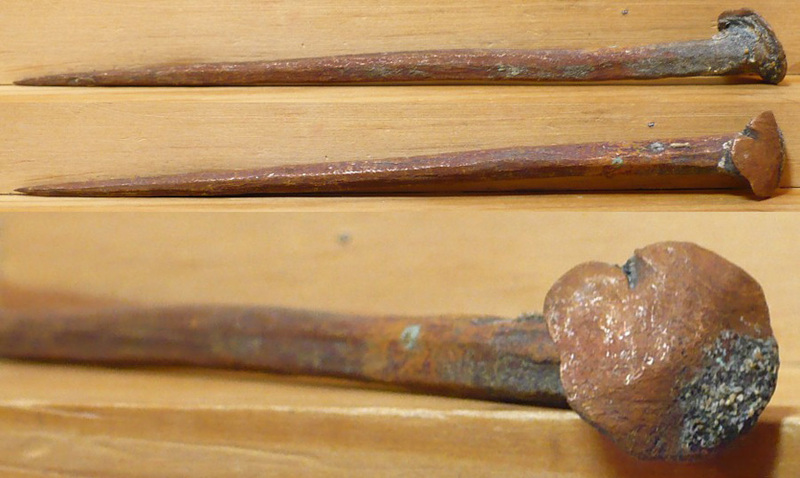 Nice bright copper patina. 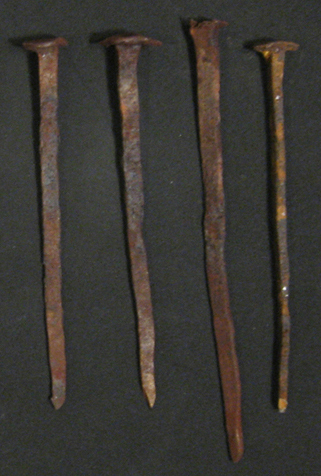 Measures 103 mm (4") long. Absolutely gorgeous example. Lovely deep emerald- to olive-green patina. 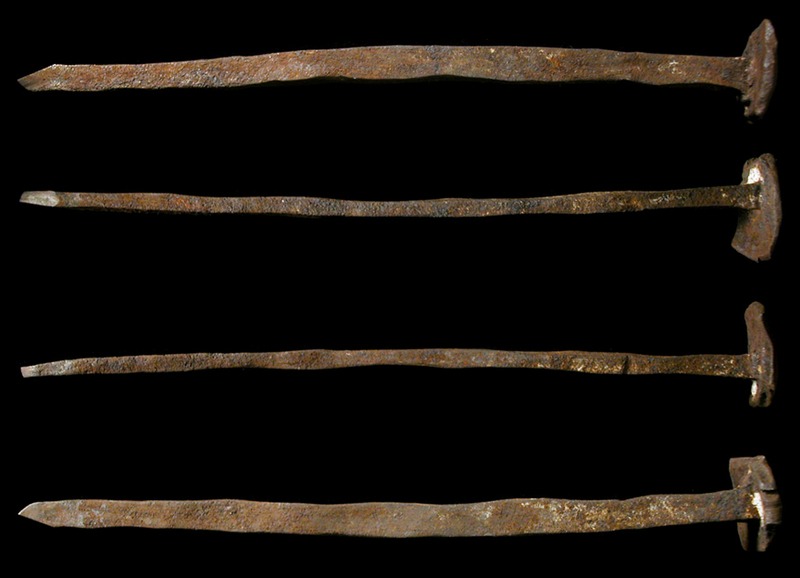 Head pounded round in antiquity, squared shaft with a slight twist, tip still extremely sharp. 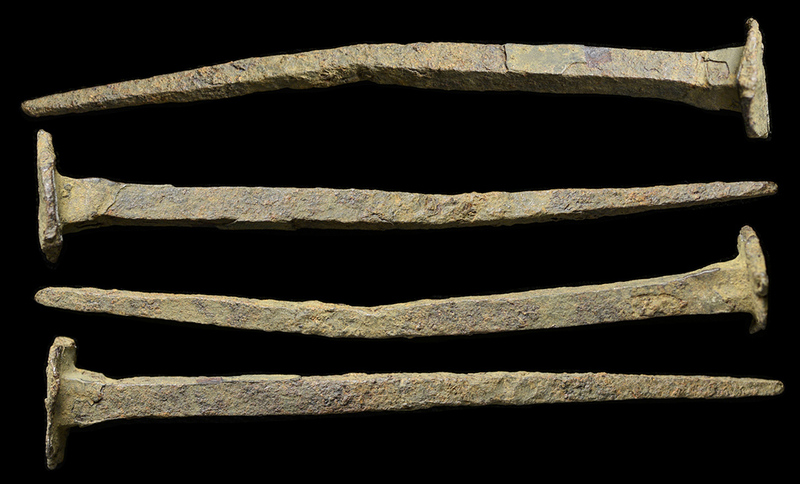 Huge ancient Roman bronze "Crucifixion spike" dating from the 1st - 2nd Century AD. Measures 177 mm (7") long! Absolutely marvelous example. 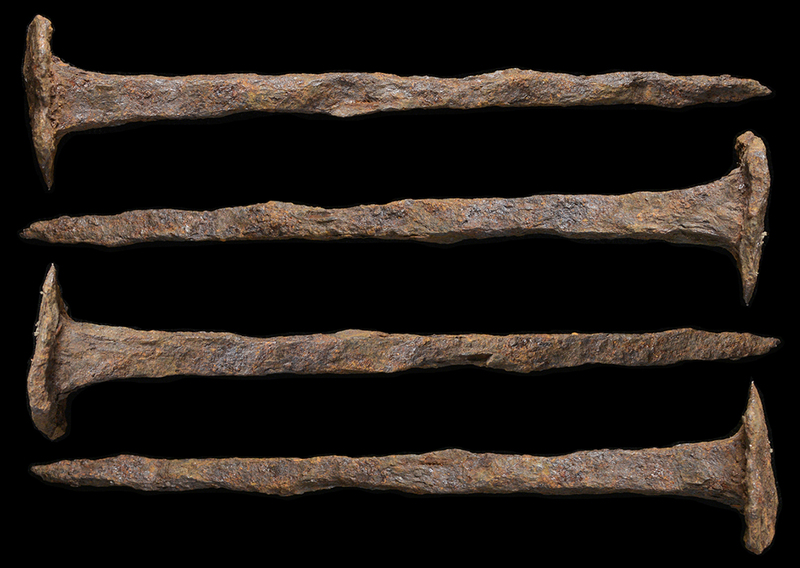 Extremely well preserved for iron. Holy Land. Roman period, 1st Century AD. 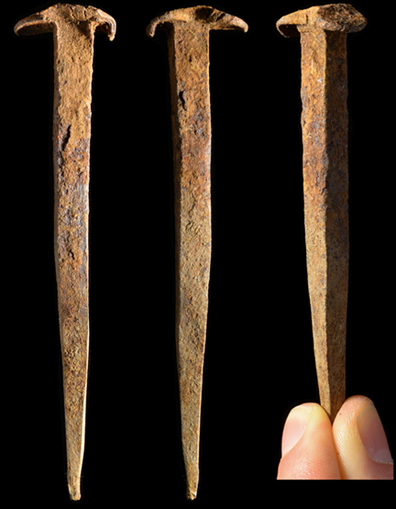 Great iron "Crucifixion spike", found in Israel! 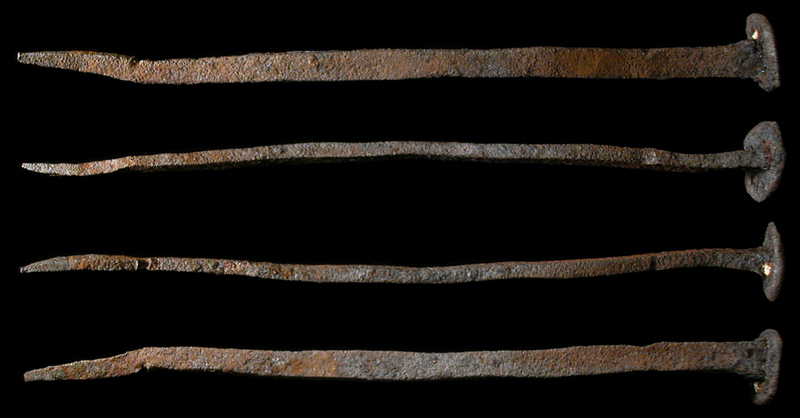 Measures 71 mm (2 3/4"), with squared shaft. 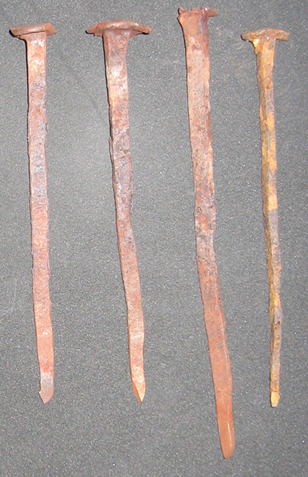 Excellent state of preservation for iron! Ex-David Hendin, Amphora. 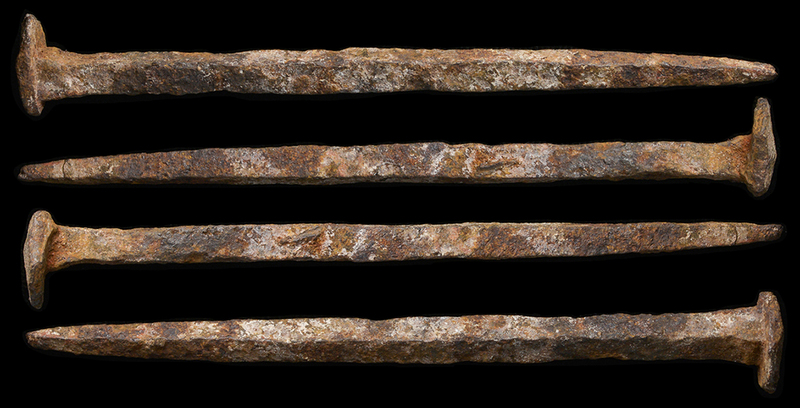 Measures 68 mm (2 3/4"), with squared shaft. 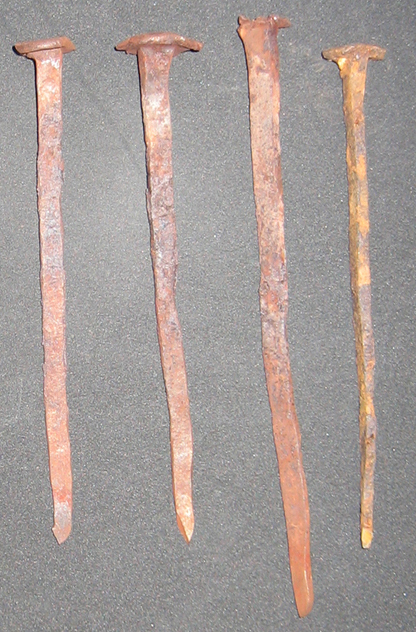 Excellent state of preservation for iron! Ex-David Hendin, Amphora. 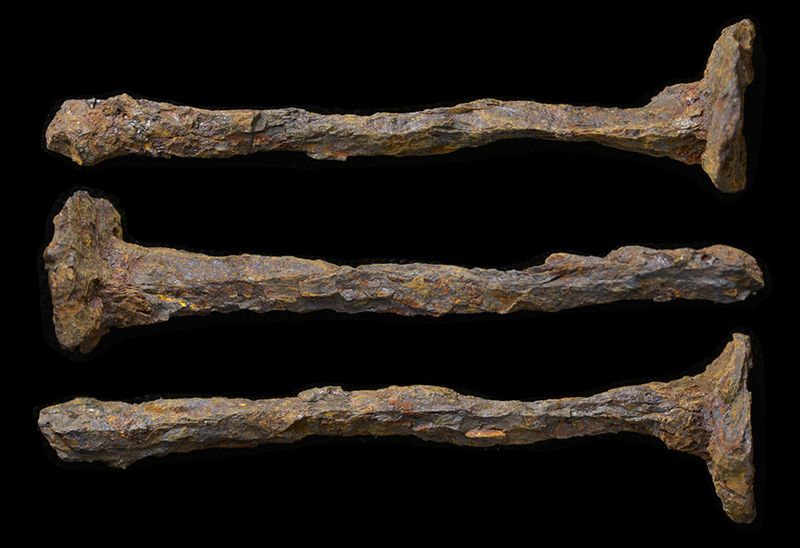 Huge ancient Roman iron "Crucifixion spike" dating from the 1st - 2nd Century AD. 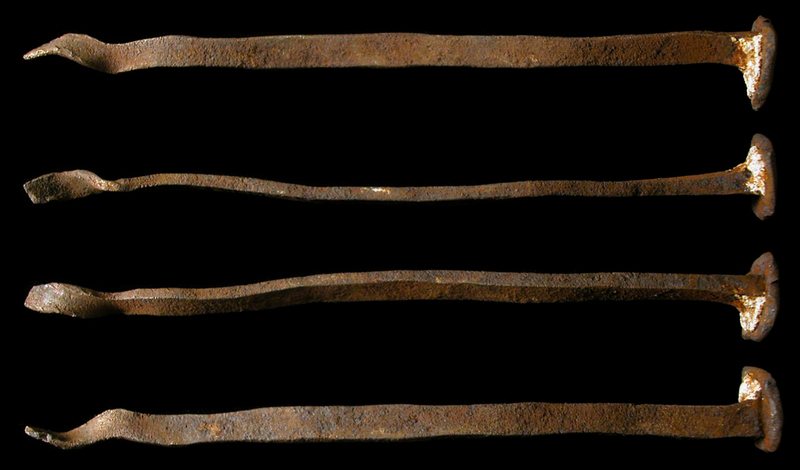 Measures 5 3/4" (14.5 cm) long! 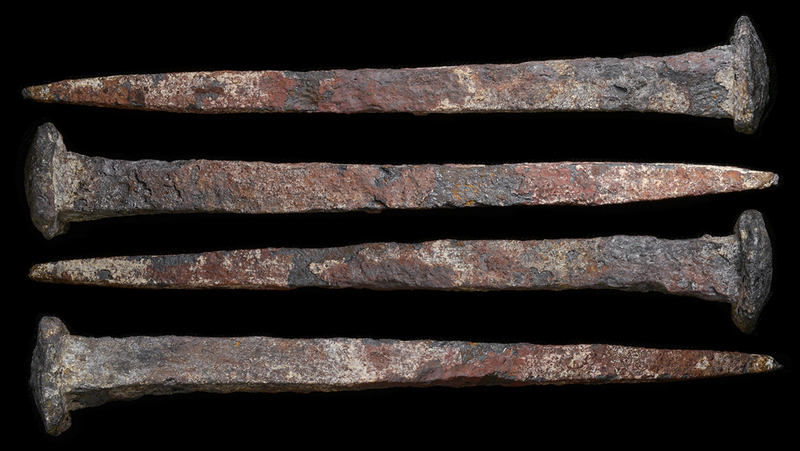 Extremely well preserved for iron, with light earthen deposits.